The orphans Fu & Rai Washio were indoctrinated by Juzoburo Nanba, and raised to be weapons for the 3-sided war for the nation. Making use of the Nebula Steam Gun, the Washio brothers became Engine Bros & Remocon Bros! However, faced with the continued evolution of the Kamen Riders that threaten their master’s will, Fu Washio plays his trump card. Uniting the power of the Engine & Remocon Gears, Fu becomes Hell Bros! S.H. Figuarts Hell Bros is another very familiar release for Build collectors. Using the iconic Night Rogue/Blood Stalk body for a base, Hell Bros builds on this with the gear theme inherited from the Bi-Kaisers. A gorgeous two-tone villain Hell Bros is armed with the versatile transforming Nebula Steam Gun system. If you have any experience with Rogue & Stalk, then you know this will be another great addition to your collection. We’ve attached the full 55 image gallery to this post, but you also read our full review by clicking “Discuss on the TokuNation Forums” at the bottom of this post. In a few days we’ll be back with the overlord of time & space himself, Kamen Rider Zi-O! 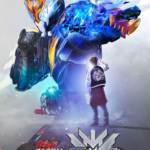 Build New World: Kamen Rider Grease V-Cinema Teaser Released! A brief teaser video has been released for the recently-announced New World spinoff film starring fan-favorite Kamen Rider Grease! At the moment, very few details about this new V-Cinema have been revealed. Actor Kohei Takeda will reprise his role as Kamen Rider Grease, while series writer Shogo Muto will be in charge of the script. Tokusatsu veteran Shojiro Nakazawa will direct the feature. We do know that Kamen Rider Grease will be receiving a unique upgrade in this V-Cinema- thanks to a new device called the DX Grease Perfect Kingdom! This item combines Greases’ own Robot FullBottle with the powers of his fellow soldiers- the Hokuto Three Crows. Grease New World is currently scheduled for release on November 11 2019! Stay tuned to TokuNation for any new details on this exciting project! 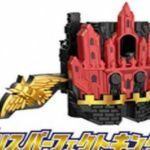 Twitter user @shin753315 has just shared a discovery that is sure to excite many fans of Kamen Rider Build. Like the recent Cross-Z New World, we’re about to get another V-Cinema taking place on this fresh Earth, with Kamen Rider Grease New World! In the video attached to shin’s tweet, we can see that there’s a deluxe DVD/Blu Ray pack slated for release the same month as the standard edition, both due in November 2019. The deluxe set is retailing for 10,000 yen and will be sold through Premium Bandai. The deluxe pack will also include a new DX Full Bottle for Grease. More details are scarce at the moment but as further information becomes available we’ll update this story. Unable to transform, Ryuga Banjou can only watch helplessly as Kazumi & Gentoku struggle against Kamen Rider Evol. But the battle before him can also push Ryuga beyond his limits. Stealing the Evol Dragon Bottle that was made from his own DNA, Banjou will unlock the power necessary to evolve even further. Reborn with even greater strength Ryuga has become Kamen Rider Great Cross-Z! S.H. Figuarts Kamen Rider Great Cross-Z is a very basic but definitely well executed repaint of the original Kamen Rider Cross-Z release. A gorgeous figure now decked out in an Evol themed color scheme, Great Cross-Z is a perfect companion piece to your Build collection and fantastic stand-in if you missed out on the original Cross-Z Figuart. Luckily this release also comes pack with all the same accessories as the first, so you won’t miss out on any of the extra hands or that sweet Beat Crosser. As a huge fan of the show, I’m really pleased to have Great Cross-Z and it’s getting me even more pumped for the upcoming Cross-Z Magma! We’ve attached the full 60+ image gallery to this post, but you can also check out the full review thread for Great Cross-Z by clicking “Discuss on the TokuNation Forums” at the bottom of this post. We’ll be back soon with another Build gallery for S.H. Figuarts Hell Bros! The Rider Kicks Figures legends line continues from Kamen Rider Zi-O! Next month offerings consist of two well loved riders from the last couple years. Making their debuts in the line are Kamen Rider Rogue and Kamen Rider GenM Level 0-X! 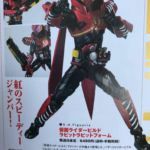 Both figures join an expanding line up for armored up Zi-O & Geiz figures as well as a number of other legends like Build, Cross-Z, Evol, and more! Both Rogue & GenM Level 0-X will be released on January 26th. Each retails for 2484 yen. Will you be adding these legends to your collection? Let us know in the thread below!